For spill response and remediation needs. 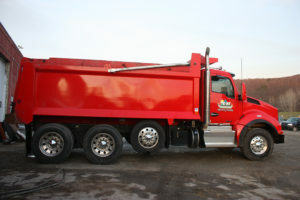 In 2009, growing out of the transportation industry Finger Lakes EnviroTech, T&R Spill Response - now known as T&R Environmental - was formed to handle a variety of transportation related spill response and remediation needs. Our environmental division quickly grew into a full-service environmental firm handling all aspects of remediation from industrial to subsurface excavation and tank removal. In addition to these services, we perform all aspects of MUTCD compliant traffic control and specialize in land clearing management. We also operate a diving and water recovery division complete with certified divers, boats, and marine lift bags. In 2015, T&R Environmental started a complete trucking division specializing in aggregate and material handling. T&R Environmental currently operates our own training and sales division known as T&R Rescue Solutions, specializing in vehicle rescue and several dealership products including Res-Q-Tec, Genesis, and B/A Products. This division handles and organizes several training events through the Northeast United States and Canada, including teaching at the New York State Fire Academy. T&R Environmental President Brian Polmanteer grew up in Bath, NY and worked part-time in his family’s service station during his high school years. After graduating college with a B.S. in Architectural Technology and Engineering, he returned to the family business as it evolved to include towing services and purchased its first heavy-duty wrecker. Serving as driver, mechanic, and laborer, Brian learned every aspect of the business. He quickly realized that what customers needed was comprehensive service for roadside incidents. Today, T&R Environmental provides that complete solution so customers can have all their spill and emergency problems addressed with one call. When it comes to environmental services, our customers need the job done right the first time. When emergency strikes, there’s no room for error. That’s why our T&R Environmental team is made up of skilled and experienced professionals committed to quality and responsiveness. Learn more about our services, our team, and our dedication to quality, safety, and efficiency. Let us answer any questions and make sure you're prepared for any incident.